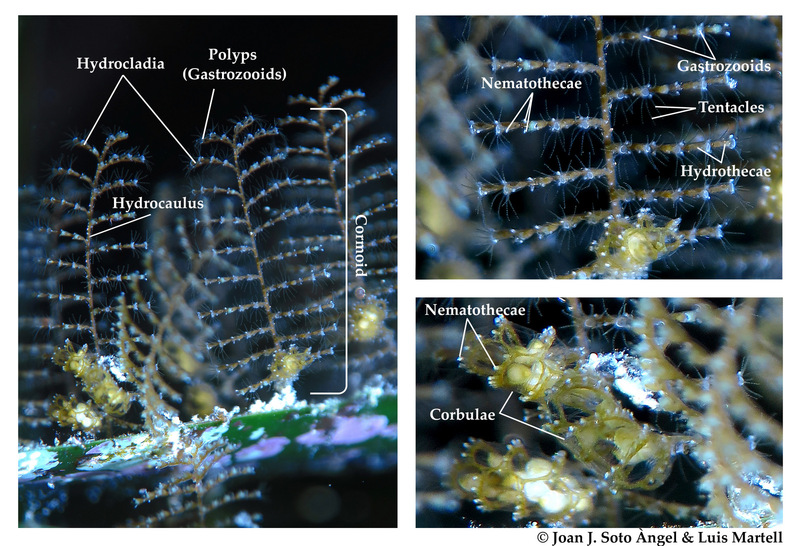 Hydroids and hydromedusae are abundant and widespread, but they can be difficult to identify, in part due to the overwhelming amount of terminology used to describe their polyps, colonies and medusae. 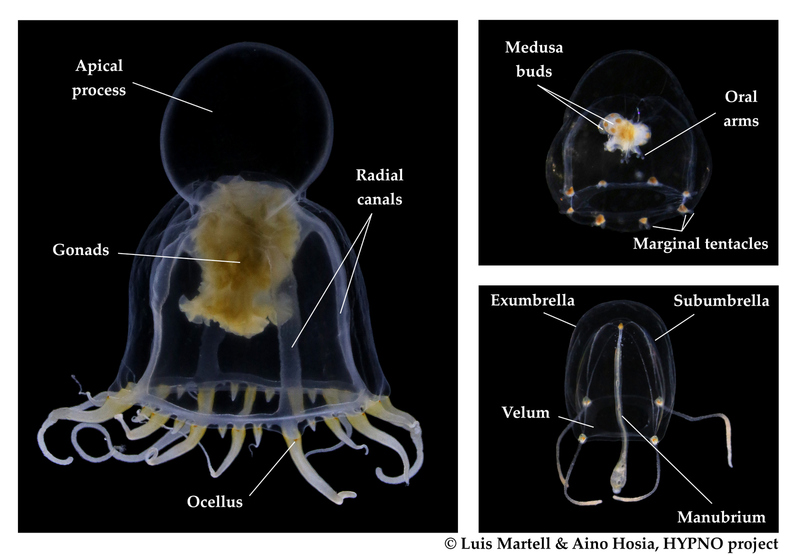 The diversity of shapes and life cycle strategies in Hydrozoa is in fact so high that it is almost impossible to find a single set of descriptive terms for all species, and different glossaries have been developed for closely related families, sometimes genera, and also for the different stages in the life cycle of the same organism. 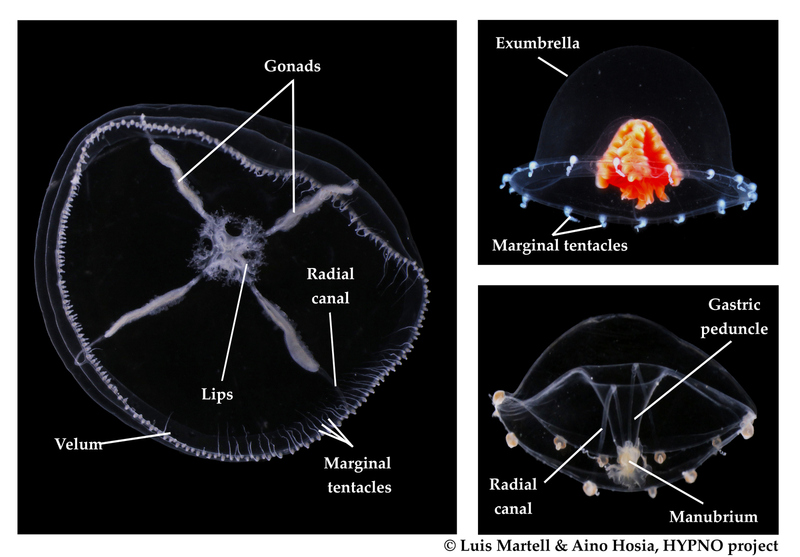 To further complicate things, the terminology we use for the characterization of hydrozoan morphology has been adapted in many cases from other fields of science (like botany and geometry), and some of the words ended up with very different meanings depending of the organism we are looking at. But if you are interested in these fascinating creatures, fear not! We at the invertebrate collections have thought about giving you a little visual aid in the form of four plates including some of the basic structures of hydroids and hydromedusa (courtesy of artsprosjekt HYPNO and upcoming artsprosjekt NORHYDRO). Figure 1: Thecate polyps, like the ones of Aglaophenia harpago, are protected by rigid structures called “thecae” into which the polyp can retract. In many species they live all together forming colonies. Credit: Joan J. Soto Àngel and L. Martell. Figure 2: Unlike their “protected” relatives, athecate polyps (e.g. those of Pennaria disticha) lack the skeletal protection of the theca, but can also form large colonies with many polyps. Credit: Joan J. Soto Àngel and L. Martell. Figure 3: The hydromedusae produced by thecate polyps are called leptomedusae, and can be recognized by the development of gonads in the radial canals (among other characteristics). From left to right and top to bottom in the picture are three species present in Norwegian waters: Tiaropsis multicirrata, Modeeria rotunda, and Tima bairdii. Credit: L. Martell and A. Hosia, HYPNO project. Figure 4: Anthomedusae (hydromedusae produced by athecate polyps) usually have the gonads developed in the manubrium. From left to right and top to bottom in the picture are Leuckartiara octona, Rathkea octopunctata, and Sarsia tubulosa. Credit: L. Martell and A. Hosia, HYPNO project. Hopefully these images can be used as a starting point for the uninitiated, and why not? perhaps also as a source of inspiration for cool marine-related presents for the season! This entry was posted in 2018 december calendar, Current projects, HYPNO, Norwegian Taxonomy Initiative, Photography and tagged Hydrozoa, nomenclature, parts of animals, taxonomy, terminology on December 2, 2018 by katrine.